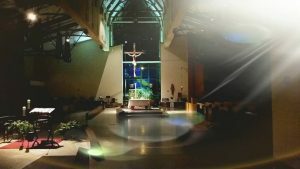 St. Anne Catholic Church, in Pleasant Prairie, Wisconsin, was established in 1998 to serve the young and growing population west of Hwy. 31. St. Anne is known for its warmth, generosity and hospitality, where families can grow and prosper through vibrant involvement in Parish life. The name St. Anne was selected in honor of a St. Anne parish in Milwaukee that had closed after 100 years. The Archbishop thought it was important to have a parish named after the mother of Mary in the diocese. Our first Mass was celebrated on July 26, 1998 – the feast day of Sts. Joachim and Anne – in the cafeteria of Pleasant Prairie School. We celebrated Mass in our church for the first time on September 11, 2004. The church was dedicated on October 3, 2004 by Archbishop Timothy Dolan. Our offices moved to the church campus in March 2007 when the Parish Center was sold. At St. Anne, we offer a number of ways to grow in faith. We invite you to learn on this website of the many ways you can grow in faith and with our parish community.